The KU-VKA Series rotary disconnect switches can be used for general purpose disconnects or as manual motor disconnect switches. They provide an economical solution for applications requiring simple power on-off switches or starting and stopping of motors. 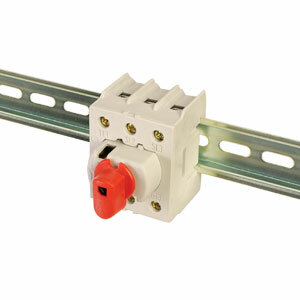 These switches are switches only and do not replace the need for fuses or circuit breakers. They are typically installed inside of an enclosure and can be mounted directly to the back panel on DIN rail and used as an internal switch. They can also be used as an external switch, mounting accessories are available for panel mounting or mounting with an extended door interlock handle. See Specs above for additional information on mounting. Auxillary switches for AU-KU disconnects, 1N.O./1N.C. Auxillary switches for AU-KU disconnects, 2N.O./2N.C. Auxillary switches for AU-VKA disconnects, 1N.O./1N.C. Auxillary switches for AU-VKA disconnects, 2N.O./2N.C. Interior Handle, snaps directly on disconnect switch. Extended Handles for Door Interlocks - requires handle and shaft.